Ghost Recon: Wildlands is a technological marvel. I said it Monday in PCWorld's initial PC performance impressions piece, and it’s worth reiterating now. This is a game where you can spend 10 to 15 minutes crossing the map by helicopter without hitting a single load screen. In a car? I don’t even want to estimate how long it’d take to cross this fictional Bolivia. A maddening amount of time, no doubt. It's stunning—and yet therein lies the seeds of Ghost Recon’s downfall. So much space, and absolutely no reason for most of it to exist. We already discussed performance Monday, so I don’t see much reason to recap here. Suffice it to say the game runs smoothly, barring a few load hitches here and there. It’s not the most beautiful game, and character models in particular dip hard into the uncanny valley, seemingly five years uglier than the surrounding scenery. But there’s so much here it’s genuinely impressive. Flying over Bolivia’s Laguna Colorada, the famous pink salt lake, and seeing flocks of flamingos take flight around you—it's seriously jaw-dropping stuff. As with so many Ubisoft games though, Ghost Recon: Wildlands is a tech and art showcase with little else to recommend it. See also:The Division, Assassin’s Creed: Unity, the original Watch Dogs. All very beautiful games, and all repetitive as hell. Wildlands may top the list in both respects. It is the most repetitive Ubisoft game yet—worse still because you’ve already played its ilk before. I’ve talked at length about the Ubisoft Formula™, the bizarre process by which all Ubisoft games have become somewhat indistinguishable, but Wildlands is the most egregious. We’re mercifully spared the whole tower-climbing routine Ubisoft made notorious, but Ghost Recon’s been transformed from a beloved tactical shooter with a rich pedigree into a cheap Far Cry clone. That’s it, really. It’s usually some sort of faux-pas to describe games within the context of other games—“It’s Dark Souls by way of Gone Home crossed with a bit of Crysis.” Ugh. That sort of info can be useful, but it also feels lazy to write. But seriously! Ghost Recon: Wildlands is just Far Cry 3! Every mission is some variation of Far Cry’s outpost infiltrations, with you scouting out a base (either with a drone or binoculars), marking targets, then either picking off targets quietly or storming your way in—or, most likely, some combination of the two. I like the moment-to-moment of Wildlands quite a bit better than its Tom Clancy brethren The Division. Ghost Recon is an actual shooter, not a shooter/RPG hybrid. You snipe a guy, he crumples. It feels snappy. Even The Division featured some incredible setpiece missions, like the shootout in Times Square. I disliked most of my time with The Division, but occasionally it would pull out a masterful bit of theater like that, really lean into its setting, and end up with something brilliant. Ghost Recon is just a blur of same-y towns and prison camps, for the most part. 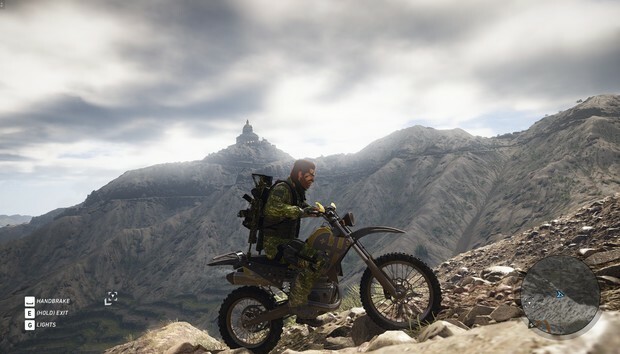 I can think of two memorable moments, one involving a massive mausoleum being constructed on a remote hilltop, but by-and-large the scenery of Wildlands—the aforementioned Laguna Colorada for instance—is entirely separate from the missions themselves. It’s eye candy to admire as you travel to the next dusty, empty town with the same handful of indistinguishable enemies to kill. And oh wow, is there a lot of traveling. The side effect of having such a huge map is that most of your time is spent just getting from place to place. Every single mission in Wildlands seems to be a five minute drive from any other mission, every road a miserable switchback up a steep mountainside, every car apparently strapped to ice skates. That’s another part of the problem: Travel in Ghost Recon just isn’t very fun. Finding the rare airplane is an actual joy, but helicopters possess the grace of a flying cow and cars drive like you’re back in Grand Theft Auto: San Andreas, with no weight or physics to the handling. Then there’s the story. I don’t even know where to start here, except to say “It’s bad.” You’re sent to Bolivia to take down the Santa Blanca cartel, a drug-smuggling, child-smuggling, smuggle-smuggling ring populated almost entirely by forgettable archetypes. You know: The old general, the young social media handler, the pop star, all with tenuous ties to this fictional drug cartel. Worse are the purposefully-edgy villains, like the torture experts who—and I swear I’m not making this up—are featured in a two-minute audio log discussing some dead guy’s genitalia. The absolute bottom of the barrel though are your own characters. Playing solo, you’ll create your character and tag along with three other AI nobodies who are insufferable. All four of them. They swear like teenagers who just learned what Urban Dictionary is, they make jokes so bad even your dad would be too embarrassed to say them out loud, their personalities vacillate between nonexistent and detestable, and they never shut up, even if you’re playing in co-op and those characters aren’t actually around. Nope, you still get to hear all the terrible barks and every useless, bland thought that comes out of their mouths. Which I guess brings us to the big caveat: Co-op. Wildlands does feature four-player co-op, which I played for a bit with my colleague Adam Patrick Murray earlier this week and again with some internet randoms later on. Wildlands is more bearable in co-op. Buggy at times, sure, but infinitely more bearable. When you can set up a real plan and execute on it, when you can ignore the trite story because you’re just there to hang out and chat with people, when those long minutes of travel downtime are filled with lighthearted chat, when every encounter has the potential to become a funny anecdote—that’s when Wildlands is at its best. It feels like a completely different game. I can say that about so many games though, many of which are better in their component bits. Hell, we even said as much about The Division last year. It was a thoroughly mediocre game, made better by having friends around. Ghost Recon is a repeat scenario. I can think of zero reason to play this game solo, but with a group? Just looking to have mindless fun? Yeah, maybe. It was enough to bump our score up a notch or two. Even so, Ghost Recon: Wildlands is not a fantastic game. Some part of me is fascinated by Wildlands in the same way I was once fascinated by Crysis. Look at what we can do. Look at these amazing virtual worlds people create from thin air. It’s just a shame so many of these worlds are about as meaningful as virtual bubble wrap. Wildlands is Far Cry, but with a weaker story and more repetition. It is Just Cause, without all the stupid explode-y bits and the potential for pure mayhem. It’s an unsatisfying, repetitive jumble, brilliant to behold and yet so numbingly empty.